Secretary of State Mike Pompeo is set to depart on a tour of the Middle East next week in a bid to galvanize regional leaders to confront Iran and remind allies that the United States is not disappearing from region amid the Trump administration's decision to pull American troops out of Syria and possibly Afghanistan, according to senior State Department officials. Pompeo will depart next week on his way to meet with government leaders in Egypt, Jordan, Qatar, the United Arab Emirates, Saudi Arabia, Bahrain, and Kuwait. The goal of the trip is to show regional allies that the "United States is not leaving the Middle East," according to senior State Department officials who previewed the secretary's itinerary on Friday. Regional allies and enemies alike have been up in arms over the Trump administration's surprise decision to pull all U.S. forces out of Syria and Afghanistan. Rogue regimes such as Iran and Russia, as well as regional jihadi groups, have celebrated the decision to withdraw, claiming victory. U.S. officials, sensitive to the negative press surrounding the decision to withdraw, emphasized that the Trump administration is not abandoning America's role in the region and its allies. "Despite reports to the contrary and false narratives surrounding the Syria decision, we are not going anywhere," said one senior State Department officials. "The secretary will reinforce that commitment to the region and our partners." Efforts to combat Iran's growing influence in the region and ongoing support for terror groups also will top the agenda. "The Iranian regime is the most dangerous actor in the region," said the U.S. official. "There is no greater threat to stability than the Iranian regime. The 12 demands that the United States has asked for remain. The secretary will continue his work on galvanizing our regional partners and allies to counter the regime's destabilizing activities." In Jordan, for instance, Pompeo will tout the country's role in combatting ISIS and ensure greater U.S. assistance makes its way to the country. "Jordan, of course, has been a key partner in the campaign to defeat ISIS and has long been a key stabilizing element in the broader region," according to the State Department officials. "And this is why the United States continues to be the single largest donor of economic security and humanitarian assistance to Jordan, providing $1.3 billion in bilateral foreign assistance to Jordan and $200 million in DOD support to Jordan's armed forces in Fiscal Year '17. And the United States' largest … aid program is in Jordan as well, and our foreign military financing with Jordan is the third largest in the world." 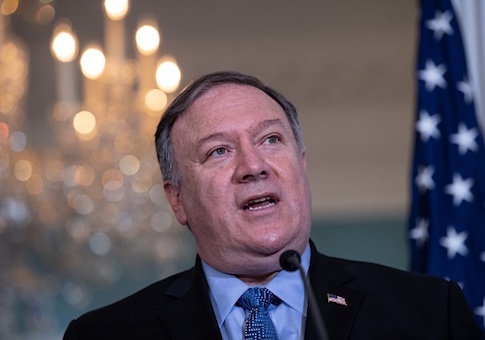 The number of nations on Pompeo's agenda is ambitious and signals the administration is aware of the backlash resulting from its decision to withdrawal from Syria. While the withdrawal has been celebrated by isolationist elements in the Republican Party, leaders on Capitol Hill have expressed frustration, arguing the Trump administration is abandoning the Middle East to Iran and other rogue actors. It is "highly unusual for a secretary of state to visit all of these countries on one particular trip," according to the administration officials. "He's visited several of them already as the secretary of state, and of course, numerous of them previously as the CIA director." "He'll be able to underscore the importance of maintaining key partnerships as we tackle common regional challenges like Syria, Yemen, and Afghanistan, and it will—his trip will also follow up on the president's summit in Riyadh in May 2017 and regular, consistent travel by cabinet officials to the Gulf such as former Secretary of Defense Mattis, Secretary of Treasury Mnuchin, Secretary of Energy Perry, who all had strong engagements in the Gulf," the official said. The administration officials also said there is no hard timeline of the troop withdrawal from Syria, a policy that has evolved since it was first announced. "We have no timeline for our military forces to withdraw from Syria," the administration officials said. "The president has made the decision that we will withdraw our military forces from Syria, but that it will be done in a deliberate, heavily coordinated way with our allies and partners. It will be done in such a way that we maintain—we and our allies and partners maintain pressure on ISIS throughout, and that we do not open up any vacuums for terrorists to exploit." The withdrawal is likely to be coordinated with regional allies and plans are currently being developed to facilitate the pullout. "The president has made the decision that we will withdraw, and we are formulating the plans to do that right now, as I said, in a deliberate and heavily coordinated way, but we will be leaving," the officials aid. "But as I said, we will be leaving in such a way that we do not open up vacuums for terrorists to exploit and that we do not allow for the possibility of a resurgence of ISIS anywhere, and that we continue to maintain the pressure against ISIS remnants now that the ISIS territorial caliphate is essentially defeated." This entry was posted in National Security and tagged Iran, Mike Pompeo. Bookmark the permalink.